Head Pain is a feeling of pain localized to the head. It can be caused by many factors. What are the Causes of Head Pain? What are the Signs and Symptoms of Head Pain? How is First Aid administered for Head Pain? Who should administer First Aid for Head Pain? 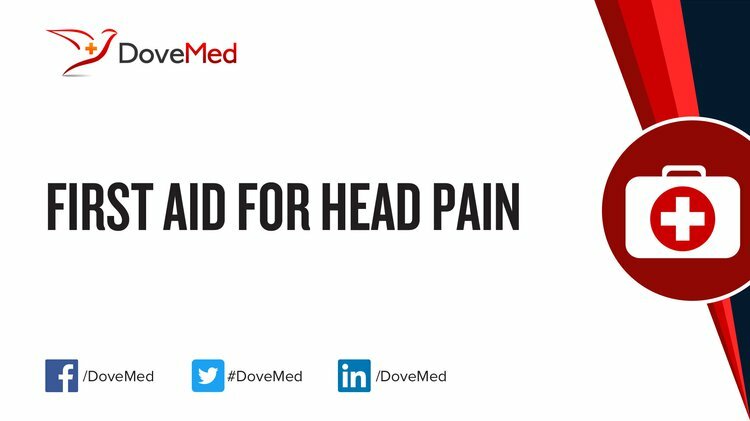 First aid for Head Pain can be administered by the affected individual or by any medical health personnel. However, in case of a chronic condition, it is better to get the Head Pain evaluated by a healthcare professional. What is the Prognosis of Head Pain? How can Head Pain be Prevented? Watson, D. H., & Drummond, P. D. (2012). Head Pain Referral During Examination of the Neck in Migraine and Tension‐Type Headache. Headache: The Journal of Head and Face Pain, 52(8), 1226-1235. Rozen, T. D. (2010). Brief sharp stabs of head pain and giant cell arteritis. Headache: The Journal of Head and Face Pain, 50(9), 1516-1519. Kashikar-Zuck, S., Flowers, S. R., Claar, R. L., Guite, J. W., Logan, D. E., Lynch-Jordan, A. M., ... & Wilson, A. C. (2011). Clinical utility and validity of the Functional Disability Inventory among a multicenter sample of youth with chronic pain. PAIN®, 152(7), 1600-1607. Digre, K. B. (2011). Headaches and other head pain. In Goldman's Cecil Medicine: Twenty Fourth Edition. Elsevier Inc..
Hincapié, C. A., Cassidy, J. D., Côté, P., Carroll, L. J., & Guzmán, J. (2010). Whiplash injury is more than neck pain: a population-based study of pain localization after traffic injury. Journal of occupational and environmental medicine, 52(4), 434-440. Glaros, A. G., & Williams, K. (2012). Tooth contact versus clenching: oral parafunctions and facial pain. Journal of orofacial pain, 26(3). Sowmanl, P. F., Wangl, K., Svenssonl, P., & Arendt‐Nielsenl, L. (2011). Diffuse noxious inhibitory control evoked by tonic craniofacial pain in humans. European Journal of Pain, 15(2), 139-145. Vincent, M. B. (2011). Headache and neck. Current pain and headache reports, 15(4), 324.